Blog of Jesse Magnan. That would make it my blog, where I post reviews, share stories and utter out loud the occasional thought that I probably should have kept to myself. Now I will admit I have been a bit lax on keeping up with this blog. I have good reasons, most of which I am not going to share with you because I am not going to whine at you about my life. Everyone goes through tough times. There is one reason I have been lax that I am going to share. I have been reading some really great books. One of which I was lucky enough to be asked to review, and as a result I received an ARC (advanced readers copy, and no you can't borrow it). 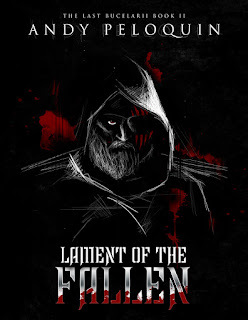 The book is The Lament of the Fallen, Book Two of The Last Bucelarii. The Lament of the Fallen is a fast paced and addictive read. We pick up with our title character, The Hunter, after he has wreaked both vengeance and havoc against those who wronged him in the city of Voramis. We are immediately enticed into wanting the Hunter to find peace but as readers we know it's not going to happen. We follow him through betrayals, addiction, mutilation, a bear mauling, and the loss of something so vital to his being that he is almost helpless without it. Almost. Now I am purposely being vague because you need to go out and READ THIS BOOK. It is everything you want fantasy to be, even playing with the Hero's Journey in such a way that you may not even recognize it at first. Andy Peloquin, the author, even has us rooting against people we would normally cheer for in other types of fantasy novels. We even come to question the concept of dogma, and the idea of being born of something evil versus doing evil acts in the name of something good. The Last Bucelarii both quenched and thirst and left me thirsty for Book 3. It was the literary version of blue balls or an unfinished sneeze. I don't just want to complete this series. I need to. The Hunter of Voramis is no more. Alone with the bloodthirsty voices in his head, fleeing the pain of loss, he has one objective: travel north to find Her, the mystery woman who plagues his dreams and haunts his memories. When he stumbles upon a bandit attack, something within urges him to help. His actions set him at odds with the warrior priests commanded to hunt down the Bucelarii. Left for dead, the Hunter must travel to Malandria to recover his stolen birthright. There, he is inexorably drawn into direct conflict with the Order of Midas, the faceless, nameless group of magicians that holds the city in a grip of terror. All while struggling to silence the ever-louder voice in his mind that drives him to kill. From feared assassin to wretched outcast, the Hunter's journey leads him to truths about his forgotten past and the Abiarazi he has pledged to hunt. His discoveries will shed light on who he really is…what he really is. Need a little extra money for your next book? eReader? Or even some minutes on Skype? Go to Bing, sign up, and do a few searches. It’s not much, but then you don’t have to do much.